Most newer vehicles feature rear cameras and a display so drivers can see when they’re backing up and avoid colliding with walls or other vehicles. Older cars without these can benefit from aftermarket sensor kits that alert drivers of potential dangers when backing up. Our top pick, and the one that's received the most positive feedback we've seen, is the Zone Tech Car Reverse Radar System. Indeed- this particular option goes by a bunch of different names. The video below unboxes the Zone Tech and demonstrates its install and use. According to buyers, it's an inexpensive, easy-to-install option that is actually pretty attractive on the dashboard. On the downside, the included drill bit won't work on metal surfaces- so you'll need to have your own tools to work with metal. Ultrasonic sensors bounce waves off objects. These waves, once returned, are analyzed by a computer, which can figure out how far away your vehicle is to an object depending on how quickly the wave bounces back (Source). Many buyers recommend getting a name brand sensor kit, and add that a good sensor system that gives you an audible alarm can actually be better than an expensive camera system because you don’t have to watch the screen. Some even go so far as to recommend having both installed (Source). In this article, we look at 5 ultrasonic backup sensor kits that are reasonably priced and easy to install thanks to included drill bits. All are rated to be durable and weatherproof as well. First up is the Ekylin Reverse Backup Radar System, which features 4 parking sensors with a minimal information LED display that shows off the distance between your vehicle and the object and gives off an audible alert if you’re too close. Comes with a drill head for easy installation of sensors into the bumper. Buyers said it’s a good value for the price, but some thought the system’s 3 foot detection range was too small. Next is the YOKKAO Rear Reverse Alert System, which also has 4 sensors and a LED display that’s similar to the Ekylin kit. Sensors are easy to install by drilling holes into your vehicle’s bumper and the kit comes with the drilling head. Resists freezing and is waterproof. Maximum effective range of about 8 feet, which is longer than the Ekylin. TVIRD Car Parking Sensor Kit is a little more advanced than the previous kits with a LED display that’s a little more colorful and informative. Features 8 ultrasonic sensors with each sensor having its own light bar display. The Dual CPU system offers high sensitivity. It’s a good quality system, but is about twice the price as the other systems we looked at. Last up is the ELEGIANT Reverse Backup Rear Radar System features 4 bumper mounted sensors. This kit also features a dual CPU system for added sensitivity. Audible alerts become louder the closer you are to the object. Users say the installation generally went quickly, but some noted the included wires might not be long enough to reach to the dash. The ELEGIANT parking sensors could be a solid option for any make of car or vehicle, van, caravan, trailer and horse boxes. Users love the functionality of this kit, but some do complain about occasional random beeping. This product is a 4-camera sensor system that detects dangers (passengers, pedestrian, children who happen to be around the moving vehicle, as well as low walls). Other features include double CPU and advanced chipset for enhanced coverage and detection (0-2.5m). The manufacturer states that the buzzer makes sounds in different frequency according to distances from the obstacles. This item might be a solid choice if you want a sensor system that helps to prevent dangerous and costly collisions that might occur when parking. In general, buyers have a very favorable opinion of the ELEGIANT car reverse rear buzzer radar system. They agree that it works well and that it is easy to fit. Users appreciate that it’s not flimsy. However, some purchasers do complain that the system might make some random beeping when backing up. One online reviewer states that the wires are somewhat short. As he explains, after pulling each wire as far as it would go, it couldn’t reach the center console. If you are looking for a parking sensor system, you might want to consider the Tvird car parking sensor kit. Users like the convenience of this device, but there are complaints regarding the length of the cables. This product is an 8-sensor system that is designed to ensure the safety of your commuting. When braking, it is said, all 4 front sensors will be active, while when reversing, 2 front and 4 rear sensors and LCD monitor will activate. According to the manufacturer, this automotive reverse radar system is made of high-quality materials that protect it from freezing, and they are said to be waterproof and shockproof. This item could be a solid choice if you want a radar system that calculates and shows the exact distance between your car and the obstacles in centimeters. In general, users state that the Tvird reverse backup radar system meets their expectations. They agree that it is very functional and convenient. Users appreciate its good quality, as well as that it works well. However, some buyers say that it would be better if all sensors had long cables since it would be easier to install the system. As they share, 4 sensors are on short cables and 4 are on long ones. One user shares that the item he received was broken on delivery. The Zone Tech car reverse backup radar system is a solid option for preventing dangerous and costly collisions that can occur easily when you are behind the wheel. Users love the performance of this unit, but some complain of receiving a malfunctioning item. This product is equipped with 4 sensors installed at the rear bumper of a car, double CPU and advanced chipset for enhanced detection. It features Adaptive Environment Technology which helps protect the item from freezing and is also said to be solid weatherproof. The manufacturer boasts that the radar system is designed with protective circuits and high-quality components to prevent it from overheating or overloading. This item might be a solid choice if you want to provide increased safety for passengers, pedestrians, and family members who happen to be around the moving vehicle. The general user consensus concerning the Zone Tech parking sensors is that they are good value for the price. Purchasers like that the system works well, as well as that it is easy to install. However, some buyers complain that they received a faulty item which stopped working after a couple of days. Many online reviewers state that the wires are short for any vehicle that is not a compact car (e.g. trucks). Several purchasers complain of receiving white instead of a black item. 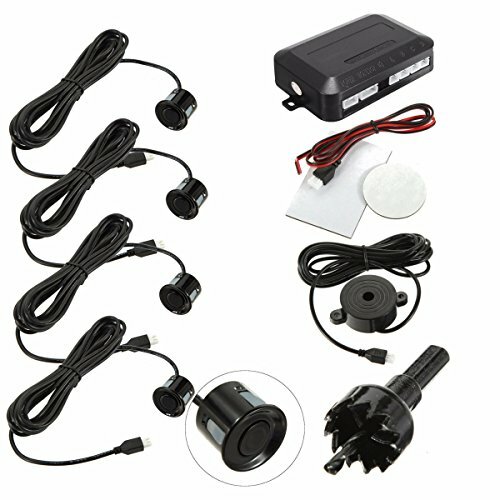 If you’re looking for top-rated parking sensors, you might want to consider the YOKKAO car parking sensor backup kit with 4 sensors. Users like the reliability of this parking sensor system, but some complain about the quality of the cables. 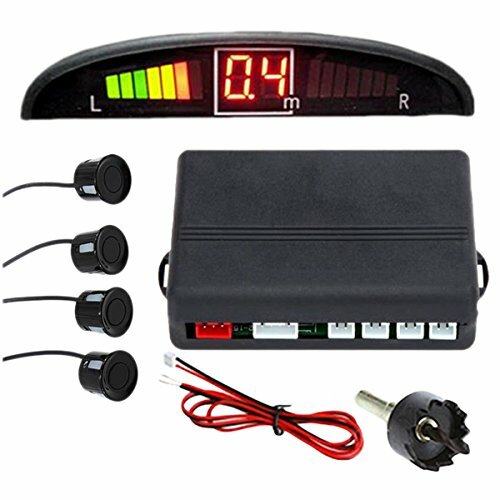 This product consists of 4 sensors, digital control box, and LED display, which is great because it makes the job of parking any vehicle much easier. It works by auto-detecting the distance between your car and back obstruction thanks to the sensors installed at the rear bumper of the car. It is available in black, white and silver color. This product might be a good option if you are looking for durable parking sensors made of high-quality materials. 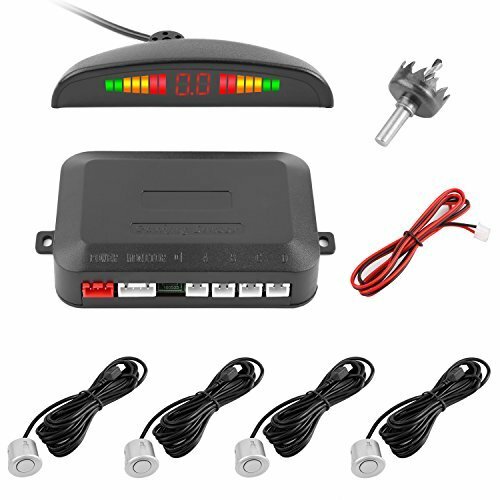 The general user consensus concerning the YOKKAO auto rear reverse alert system is that it is reliable and works well. They appreciate that the sensors have clean, neat finish. One online reviewer recommends twisting the sensors when you’re inserting them so that they go all the way in. However, some buyers complain about the cables, stating that they are made of poor-quality materials. The EKYLIN car parking sensors are a solid option for someone who wants an easy-to-install model. Users like the usefulness of this device, but some do complain of receiving a faulty item. This product is a parking sensor system that emits a beeping sound which gets more and more frequent as you get closer to an obstacle. The kit features 4 weatherproof, ultrasonic sensors and a LED distance display. 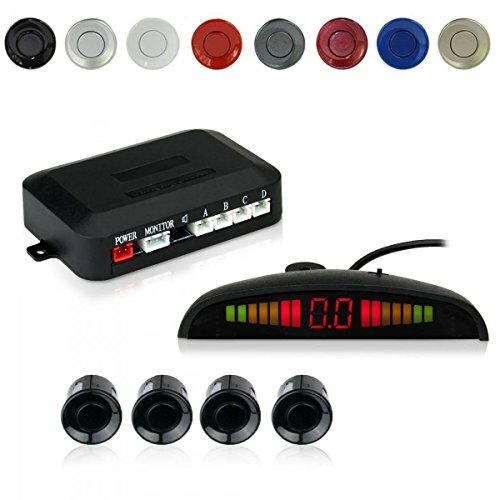 You can choose between 7 colors of the sensors which match your car best. This item seems like a solid choice if you want to prevent dangerous and costly collisions. The general user consensus concerning the EKYLIN vehicle reverse backup radar system with 4 parking sensors is that it gives you a peace of mind with extra eyes backing up. They agree that it works well, as well as that it is easy to install. However, some buyers complain of receiving a malfunctioning item. For example, one user shares that his system has one sensor that was dead on arrival. Another one states that his unit beeps constantly, which makes it just more of a reminder that you are backing up. 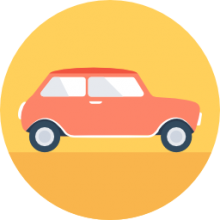 If you’re looking for a quality parking sensor, whether for a car, van, or hybrid vehicle, our guide above is a great place to start. In general, these proximity sensors are engineered to make drivers aware of potential parking obstacles by employing either ultrasonic or electromagnetic sensors. By assessing distance of nearby objects in the rear and front bumper fascias provide the driver information so that he or she can avoid harming his car with scratches or dents. They’re able to send out acoustic pulses modulated by a control unit that assesses the return interval- and in this way, object distances are calculated. Many models provide acoustic feedback-this takes the form of beeps that let the driver know when they are getting too close to an object. There are also units that provide visual feedback-and in this way as you near an object the visual feedback system lets you know exactly how close you are to an outside vehicular obstacle. One caveat for ultrasonic systems is that since it depends on soundwave reflection, it sometimes has particular trouble with flat objects that are not big enough to effectively reflect sound like a thin pole. Another trouble that it runs into is dealing with softer obstacles that have sound absorption properties- this weakens its detection abilities. An example is moss or wool coated objects. Historically, one of the first parking aids was produced in the 1970s by Tony Heyes. He was working at England-based mobility research lab when he realized the automotive value of his invention. On the other hand, electromagnetic systems Doesn’t require that any holes be drilled into the bunkers-this is obviously preferable as people do not want to go around drilling holes into their cars. Though, nowadays, these automotive assistance aids are available as both baseline and premium features on newer vehicles. So you don’t always have to purchase an aftermarket sensor to install on your car. Blind spot monitoring is a little bit different-this technology primarily operates on the side of your car, frequently including cross traffic alerts, and also ensuring that you don’t ignore obstacles and approaching vehicles in your rearview mirror blind spots.